Brad Heberlee, Kelley Curran, and Susannah Millonzi in Peter Pan. Photo by Jeremy Daniel. BOTTOM LINE: This deep dive into the subtext of the familiar and beloved play is not for everyone, least of all kids. Living up to their name, the theatre company known as Bedlam has sprinkled their pixie dust on J.M. Barrie’s Peter Pan, and the result is by turns hilarious, baffling, and disturbing. Eric Tucker directs a cast of six (including himself) in an adaptation of the much-loved 1904 stage play, later made into a novel, a Broadway musical, and several films. In Bedlam’s version, the psychosexual drama bubbling underneath the surface of the text has burst forth, soaking the scenery. As in his excellent production of Shaw’s Saint Joan, Tucker uses a limited ensemble to embody a myriad of characters, from the Darling family and the Lost Boys to Captain Hook and Tinker Bell (Tiger Lily and the Indians don’t appear at all, which is probably for the best). “Traditional” casting practices are frequently upended, with Peter, normally performed by a woman, here played by a bearded Brad Heberlee (who doubles as Nana, the Darlings’ canine nursemaid). In another audacious revision, the actor who plays Mrs. Darling (Zuzanna Szadkowski) later becomes Captain Hook; Mr. Darling (Tucker), Hook’s usual double, is demoted to the hapless bo’sun Smee. Tucker is clearly less interested in telling this familiar story than in dissecting it, exploring both the dark underbelly of the play and the ways in which it has become a part of popular culture. His Pan takes place in no fixed time period or specific place. For these and other reasons, it would likely be terrifically confusing for audience members whose knowledge of this tale comes chiefly from the Disney cartoon. 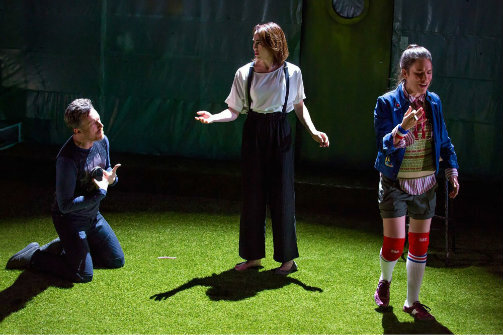 Those who come expecting a child-friendly production will also be taken aback: the sexual tension between Peter and Wendy (a lovely Kelley Curran) has been boosted sky-high, and Mrs. Darling seems pretty hot to trot for Peter herself. This uncomfortable adult reading of the play is initially provocative but eventually becomes repetitive and cringeworthy. For admirers of Bedlam’s adventurous stagecraft and stellar ensemble acting, and for Peter Pan superfans, this 21st-century remix of Barrie’s Edwardian-era drama is full of surprises. Stripped of flying effects and period trappings and somewhat overlong, it still evokes both the humor and the pathos inherent in the story of the Boy Who Wouldn’t Grow Up. However, under no circumstances should you bring the kids. Peter Pan is adapted by the company from the original play by J.M. Barrie. Directed by Eric Tucker. Set Design is by John McDermott. Lighting Design is by Les Dickert. Costume Design is by Charlotte Palmer-Lane. Choreography is by Alexandra Beller. Sound Design is by Eric Tucker. Production Manager is Joshua Shain. Production Stage Manager is Diane Healy. The cast is Kelley Curran, Brad Heberlee, Edmund Lewis, Susannah Millonzi, Eric Tucker, and Zuzanna Szadkowski.